Drosophila is one of the premier organisms for studies of genetics, development, population biology, and evolution. Drosophila Information Service is a journal devoted to disseminating information useful to researchers, teachers, and students. Each issue contains descriptions of new techniques, research reports, new mutants, teaching exercises, summaries of recent regional and national conferences, and general announcements of interest to the research community. Drosophila Information Service was first printed in March, 1934. Material contributed by Drosophila workers was arranged by C.B. Bridges and M. Demerec. As noted in its preface, which is reprinted in volume 75 (1994), Drosophila Information Service was undertaken because, "An appreciable share of credit for the fine accomplishments in Drosophila genetics is due to the broadmindedness of the original Drosophila workers who established the policy of a free exchange of material and information among all actively interested in Drosophila research. This policy has proved to be a great stimulus for the use of Drosophila material in genetic research and is directly responsible for many important contributions." During the many decades since that first issue, DIS has continued to promote open communication. Contributions are accepted at any time, and the journal is published once annually. 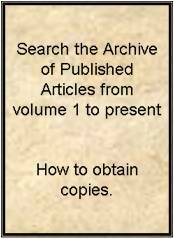 This page has links to a Guide to Authors and an Invoice for ordering past and future volumes.